Heterostracan diversity (not to scale). Head shields in dorsal view and reconstructions in lateral view (B2, F2); A - Traquairaspidiformes (Traquairaspis); B - Cyathaspidiformes (B1, Poraspis; B2, Anglaspis); C - Amphiaspidida (C1, Kureykaspis; C2, Eglonaspis); D - Anchipteraspididae (Anchipteraspis); E - Protopteraspididae (El, Protopteraspis; E2, Doryaspis); F - Pteraspididae (Fl, Rhinopteraspis; F2, Errivaspis); G - Psammosteida (G1, Drepanaspis; G2, Pycnosteus). From Janvier & Blieck (1993). The Heterostracans are an important lineage that includes such ostracoderm types as the pteraspids, cyathaspids, amphiaspids, and many other groups They are restricted to the Silurian and Devonian periods (reaching their height during the Late Silurian and Early Devonian), in the biogeographic provinces of Euramerica, Siberia and Tuva. The Heterostracans comprise two major monophyletic groups, the Pteraspidiformes and Cyathaspidiformes (each of which can be given the Linnaean rank of Order), and a number of minor groups (Traquairaspids, Corvaspids, Lepidaspis, and others), some of which may be general primitive forms. MAK000112. However, in the mid-Silurian, it was the Heterostraci who were lords of the vertebrate domain in what is now the Northern Hemisphere. The Heterostraci are first found in the lower Silurian, about the same time that most of the other major Paleozoic fish groups got their start. They apparently radiated rapidly and evolved a number diverse forms which are now difficult to fit into a cohesive picture, such as Lepidaspis, which looks something like a hot dog bun (or, more exactly, a kolache) with the sausage sticking out of one end. Unlike the ponderous osteostracans or fragile anaspids, the Heterostraci possessed virtually no endoskeleton. Even their dermal plates were made up of acellular aspidine and dentine, requiring little metabolic investment beyond the initial cost of construction. Only one species (Torpedaspis) shows signs of subaponevrotic circulation, the layer of vessels that feeds the cells at the base of living bone. The inner surface of the dermal plates is smooth and shiny, showing no evidence of even cartilaginous attachments. The only evidence of endoskeletal material are the ambiguous indentations radial to the gill lamellae and traces of possible arcualia along the line of the notochord. The Heterostraci had other advantages, as well. Long before the teleostomes managed the trick, the Heterostraci developed a single common branchial opening, minimizing the surface exposed to parasites and avoiding multiple openings in the body wall. The symmetrical, diphycercal tail, not perfected by gnathostomes until the Cretaceous, was standard equipment on heterostracans in the Silurian. It is not clear whether heterostracans had precise muscular control of the tail -- their only mobile fin -- in the same way as fish of the gnathostome lineage. The tail, like the rest of the body, had no internal skeleton and was reinforced only by lines of scales. However, the Heterostraci were not conspicuously flattened fish. They do not seem to have the conventional design of bottom-dwelling fishes, although they are often depicted in that fashion. They may well have been slow and sloppy swimmers compared to later forms. The very fact that they are not found worldwide is a convincing argument that they cannot have been nektonic athletes. Yet it is equally hard to see them as vertebrate barnacles. Simplicity has its virtues. However, by Mid-Devonian times, the Heterostraci were in relative decline. A few lines, notably the large psammosteids, staged a revival in the Late Devonian, but all were extinct before the Carboniferous. The lesson may be that a simpler body plan gives a clade an evolutionary head start. However, the more complex body plans have a long term advantage because of their ability to adjust to varying conditions. Simplicity of structure necessarily implies simpler responses to the environment. Certainly, any given arrangement of greater complexity is likely to fail, since its needs and requirements are also likely to be complex. However, once conditions permit radiation of the more complex forms to begin, that radiation is likely to be more durable because it inherently contains more diversity. This diversity permits greater success by specialization in good times, and more niche survivors in bad. ATW020510, revised ATW030512. The Cyathaspidiformes probably include some fairly active swimmers, although the heavy Armour would presumably slow them down. This clade has both streamlined and flattened forms, distinguished by a head shield ornamented by longitudinal dentine ridges, the dorsal (upper) shield fused into a single plate, and the presence of vertical flange scales on the tail. They appear in the early Silurian with Athenaegis (the earliest known Heterostracan), but do not really diversify until the later part of the period (Ludlow epoch). By the end of the Early Devonian they were in decline, and died out at the Emsian/Eifelian (Early/Middle Devonian) boundary. 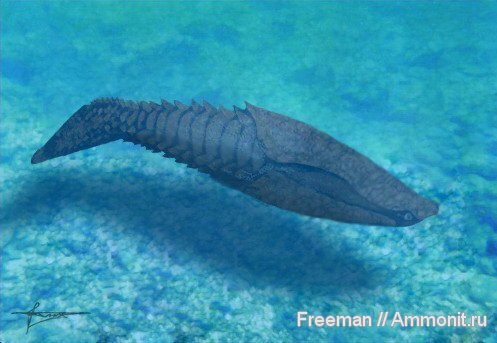 The Cyathaspidida were quite long-lived types that appeared during the Late Silurian (Ludlovian) and continued to the end of the Early Devonian (Emsian epoch). They are part of the endemic Euramerican fauna. They were generally streamlined forms with fusiform or cigar-shaped head-shields, and deep vertical flange scales arranged along the tail. They were probably fairly active but short distance swimmers. These jawless fish may have used water jets from their branchial openings as a propulsive or stabilizing device, to compensate for the lack of paired fins. The illustration at the right shows a Cyathaspidiform in anterior (front) view, illustrating this hypothesis of the stabilizing function of the water jet from the common external branchial openings (stipple). The Amphiaspidida were specialized forms limited to the first half of the Early Devonian Lochkovian and early to mid Pragian epochs) of the Siberian (Angoran) bio-region. The head-armour is fused into a single unit, and the entire head was flattened, indicating that they were bottom- dwellers, and possibly even burrowers, who would lie mostly submerged in the sand or mud. In some forms, the front of the armour is elongated into a tube-shaped structure, and the eyes disappear (Empedaspis, Pelurgaspis, Eglonaspis). In others (Prosarctaspis, Kureykaspis (illustrated above), Olbiaspis, Gabreynspis), there is a special opening, the adorbital opening, in front of the eyes, which has been variously interpreted as a spiracle, a 'pre-spiracle', or a single nostril. It is probably an inhalant opening that allowed these creatures to live half-buried in the bottom sediments, like modern rays. MAK000112. Early Silurian to Late Devonian. Heterostracomorphi: Astraspidae + *: Cyathaspidiformes + Pteraspidiformes. Generally oblong, fusiform shape, with some species dorsoventrally flattened; fan-like lower oral plates; upper oral plate normally rigid; head normally covered with single large dorsal and ventral plates, typically elongated lateral branchial plates; orbits small; $ single pair of gill openings; possible prenasal sinus or naso pharyngeal tract partially separated from oral cavity; no indication of endoskeleton except head shield impressions of possible arcualia and possible gill arches; head shield has impressions of 2 SCCs, 8-10 transverse gills and possibly gill arch bones radial to gills; ventral plate shows median impression (lingual apparatus? ); brain shows 3 segments (pineal, metencephalon or cerebellum, and medula oblongata); where known, posterior covered with large scales; large median dorsal and ventral ridge scales; no fins except caudal; caudal fin primitively di- (poly?-)phycercal with lines of scales rather than fin rays; tail may also be pad-like; no paired appendages; interior of plates smooth & shiny - no evidence of attachment for endoskeleton; sub aponevrotic circulation known only in one species (Torpedaspis); trilaminar dermal skeleton with basal laminar layer, cancelous aspidine central layer, and tuburculate dentine outer layer showing characteristic grebeshkis. Image: (R) after Janvier, P. (1993), Patterns of diversity in the skull of jawless fishes, in Hanken, J& BK Hall (eds. ), The Skull, 2:131-188, U. Chicago Press. Image (L) Athenaegis chattertoni model courtesy of Dr. Mark Wilson, Univ. of Alberta. APW040316. Range: Silurian to Early Devonian of North America and Russia. Heterostraci: Pteraspidiformes + *: Corvaspididae + (Cyathaspidida + Amphiaspidida). Characters: parallel, finely crenulated dentine ridges form ornamentation of dermal plates; flange scales arranged in chevrons. Links: Tree of Life; Corvaspis; Anglaspis, Cyathaspidiformes. APW040316.